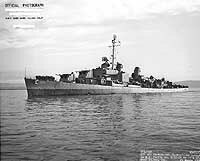 USS Walke, a 2200-ton Allen M. Sumner class destroyer, was built at Bath, Maine. Commissioned in January 1944, she visited Washington, D.C. in mid-February, while en route to undergo shakedown training off Bermuda. The new destroyer also took part in underway refueling and sonar tests before crossing the Atlantic in May to participate in the next month's Normandy invasion. Walke returned to the U.S. in July 1944 and in September transited the Panama Canal to join the war against Japan. She arrived in the western Pacific in November to help screen the Third Fleet's aircraft carriers during strikes on targets in the Philippines. In December she participated in landings at Ormoc Bay and Mindoro. During the latter operation she used her guns to destroy the grounded Japanese destroyer Wakaba. 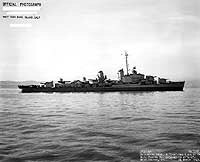 In her next mission Walke protected minesweepers that were clearing Lingayen Gulf for the invasion of Luzon. 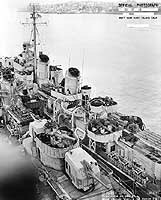 While so engaged on 6 January 1945 she was attacked by four enemy suicide planes, one of which struck the ship's forward superstructure. 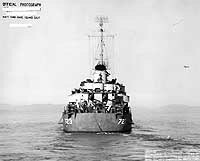 Walke was extensively damaged and thirteen of her crew lost their lives, among them her Commanding Officer, Commander George F. Davis. However, she remained on station for three more days before retiring to safer waters, and ultimately steaming back to the U.S. for repairs. Walke returned to the war zone in May 1945, in time to take part in the battle for Okinawa. 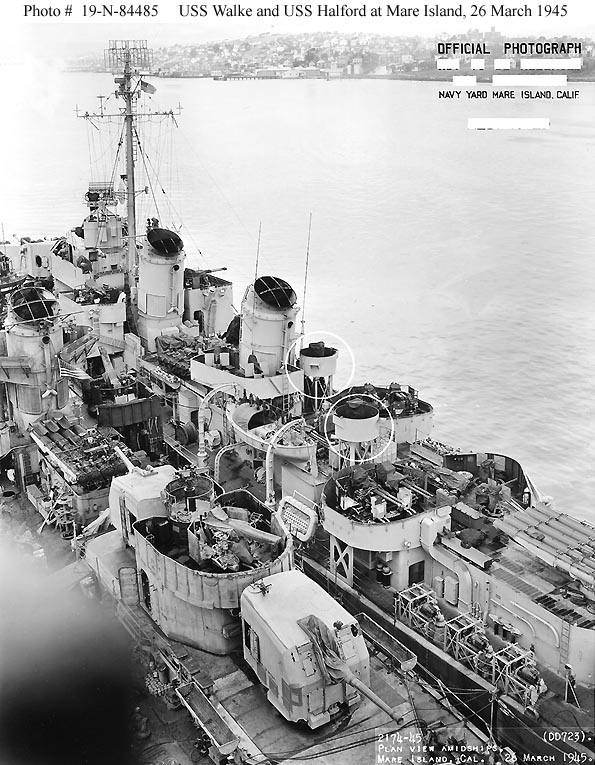 During the weeks before and after Japan's formal surrender on 2 September she escorted the fast carriers of Task Force 38, and at the end of that month began the long voyage home. 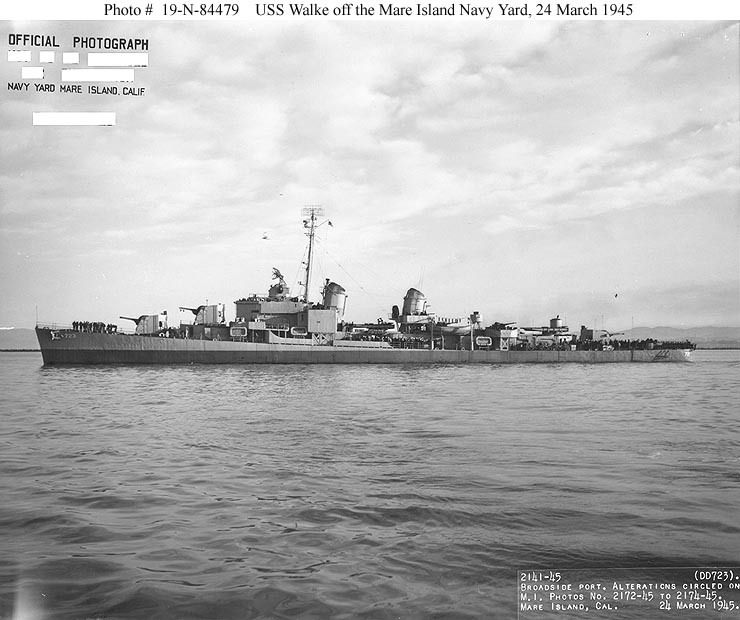 Walke continued her operations with the Pacific Fleet into the post-war era, deploying to the Marshall Islands for the July 1946 atomic bomb tests and to Australia in 1947. 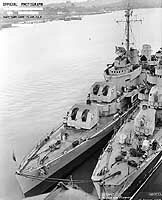 She was decommissioned in the middle of the latter year and remained in "mothballs" at San Diego, California, until October 1950, when she returned to active service in response to the intense fighting in Korea. Her first Korean War cruise began early in January 1951 and included carrier screening and shore bombardment missions. While well offshore on 12 June Walke was badly damaged by a drifting mine, losing 26 crew members killed and 40 injured. Repaired, she had another combat tour from June 1952 to January 1953 and was back in Korean waters for a third time when the fighting ended in July 1953. During the rest of the 1950s and the first half of the 1960s, Walke regularly visited the Far East, as well as taking part in exercises in the eastern Pacific. She was heavily modernized in 1961, trading in her secondary gun battery and anti-ship torpedoes for drone helicopter facilities, new sonars and other modern equipment. Between March and September 1965 the destroyer made the first of four Vietnam War deployments. Others followed in 1966, 1967-68 and 1969. She spent 1970 in West Coast waters and was decommissioned at the end of November. 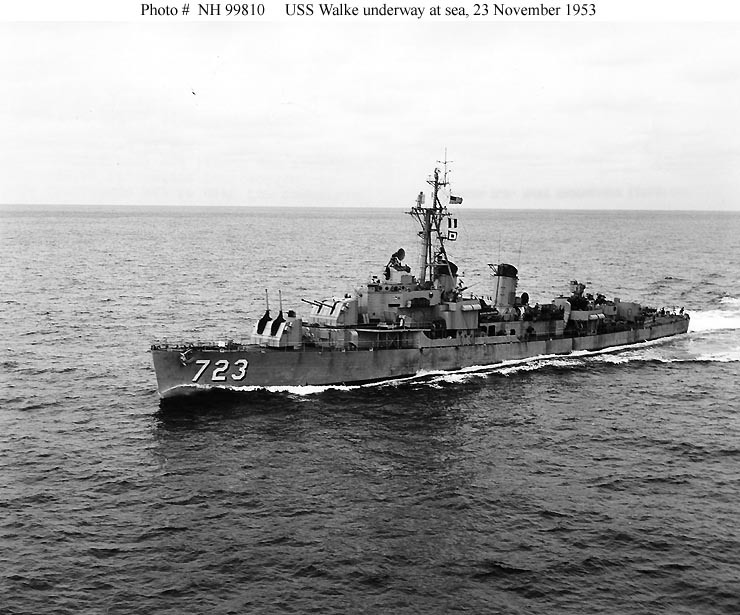 In February 1974, following more than three years in reserve, USS Walke was stricken from the Naval Vessel Register. She was sold for scrapping in April 1975. USS Walke was named in honor of Rear Admiral Henry A. Walke (1809-1896), a important figure in the Civil War's Western Rivers campaigns. 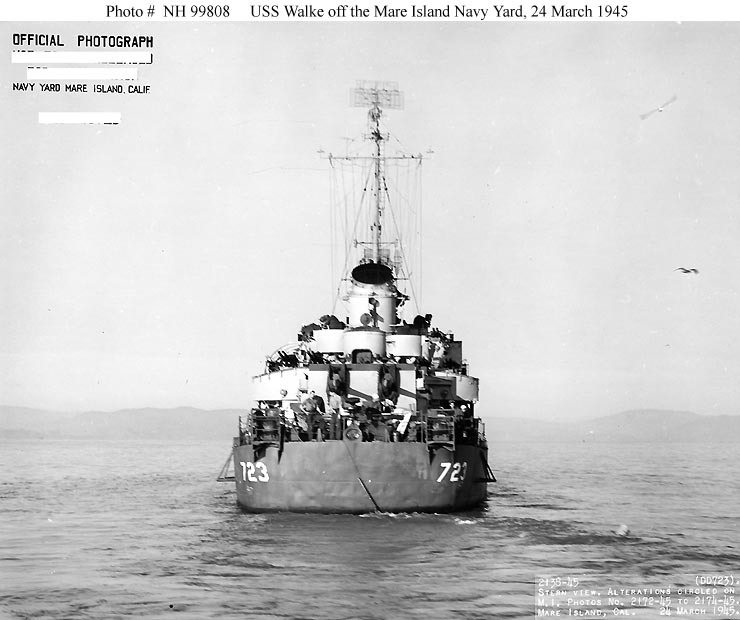 This page features, and provides links to, all the views we have concerning USS Walke (DD-723). 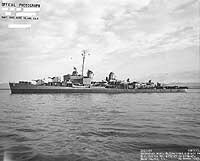 USS Walke (DD-723) -- Miscellaneous Views. Commander George F. Davis, USN, (1911-1945). Covering the landings in Lingayen Gulf, Luzon, Philippine Islands, 9 January 1945. 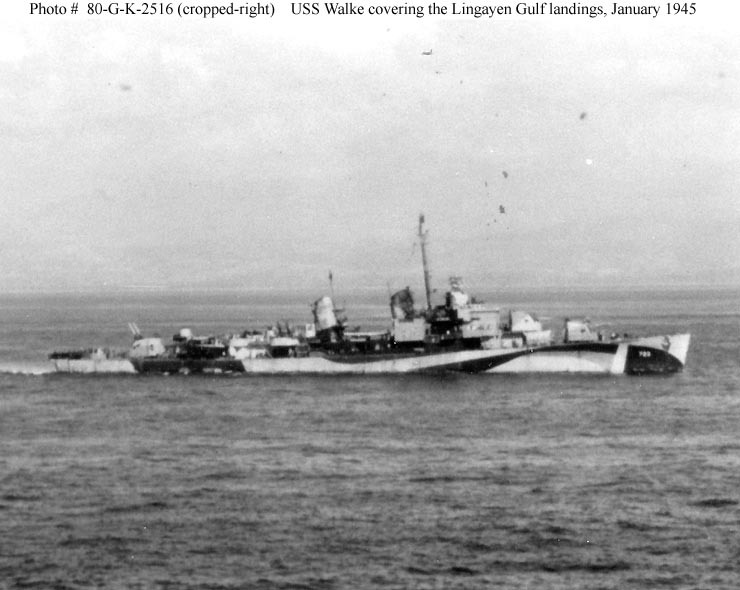 This image is cropped from Photo #: 80-G-K-2516 to emphasize Walke's camouflage pattern, which appears to be Camouflage Measure 31, Design 25D. 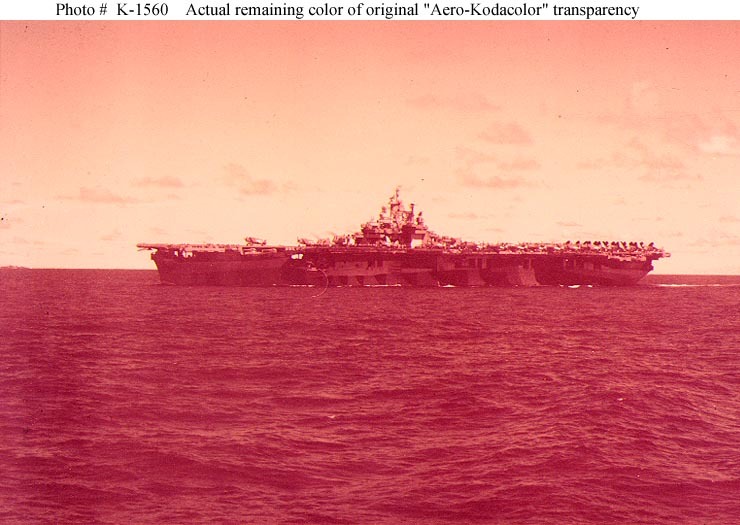 Note: Though this was originally a color image, the original "Aero Kodacolor" transparency has lost all colors but red, and can now only be reproduced in monochrome. For an example of this situation, which is typical of this film type, see Aero-Kodacolor Transparency 80-G-K-1560. 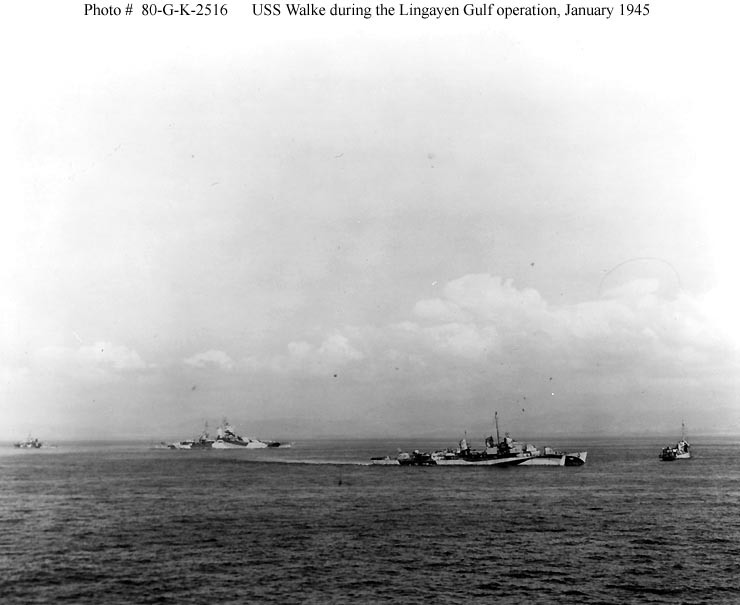 Cover the landings in Lingayen Gulf, Luzon, Philippine Islands, 9 January 1945. 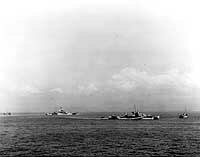 Two other destroyer types are present at each side of the photo. Walke is painted in what appears to be Camouflage Measure 31, Design 25D. Mississippi's camouflage is Measure 32, Design 6D. Off the Mare Island Navy Yard, California, 24 March 1945. Off the Mare Island Navy Yard, 24 March 1945. Plan view, forward, taken at the Mare Island Navy Yard, California, 26 March 1945. 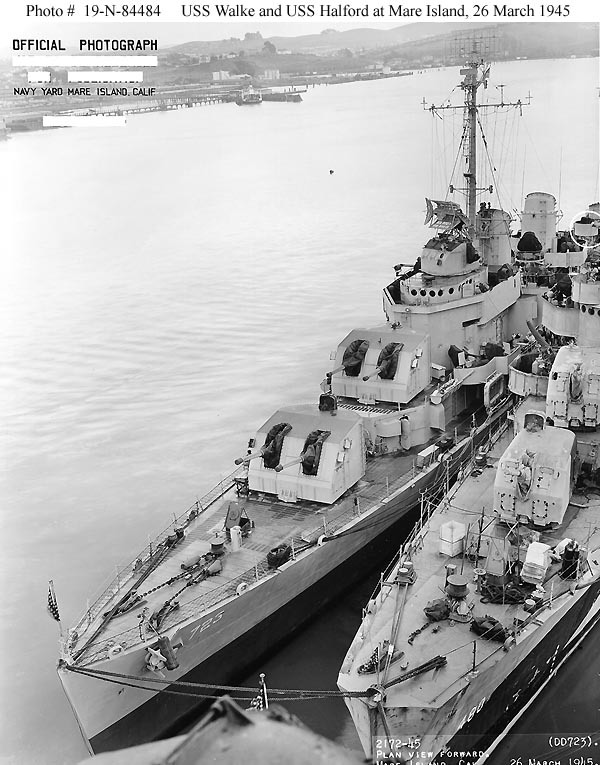 USS Halford (DD-480) is at right, with her bow shortened as the result of a collision with the M.S. Terry E. Stephenson in Saipan harbor on 14 February 1945. White outlines mark recent alterations to Walke. Plan view, amidships, taken at the Mare Island Navy Yard, California, 26 March 1945. Note her K-Gun depth charge throwers and quadruple 40mm gun mounts. 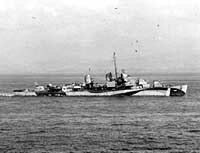 Ship in the foreground is USS Halford (DD-480). 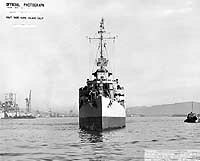 Plan view, aft, taken at the Mare Island Navy Yard, California, 26 March 1945. 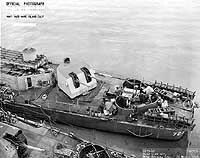 Note her stern depth charge installation, after 20mm machine gun position, 5"/38 twin gun mount and quintuple 21-inch torpedo tubes. Underway at sea in Far Eastern waters, 23 November 1953. Photographed by W.L. Fowler, of USS Yorktown (CVA-10). 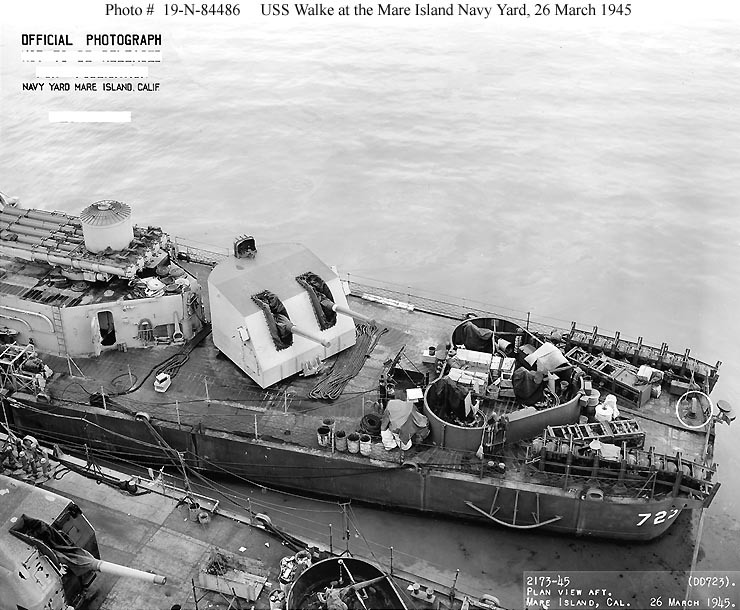 Note that Walke has been refitted with 3"/50 guns by this time, replacing her original 40mm battery. 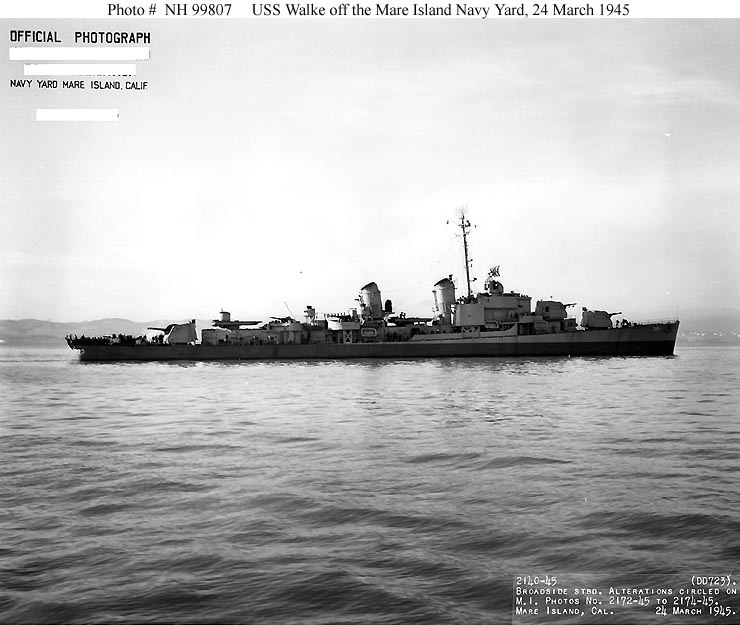 USS Walke (DD-723) underway in Boston Harbor, Massachusetts, 10 February 1944. Photographed from a squadron ZP-11 blimp. Starboard broadside (somewhat toward the bow) aerial view. Walke is painted dark gray overall, probably Camouflage Measure 21. USS Walke (DD-723) steaming on course 085 off the U.S. East Coast (position 36 55'N, 74 56'W) at time 1245, 8 April 1944. Photographed from a squadron ZP-14 blimp. Starboard broadside aerial view. Walke is painted in Camouflage Measure 32, Design 3D. 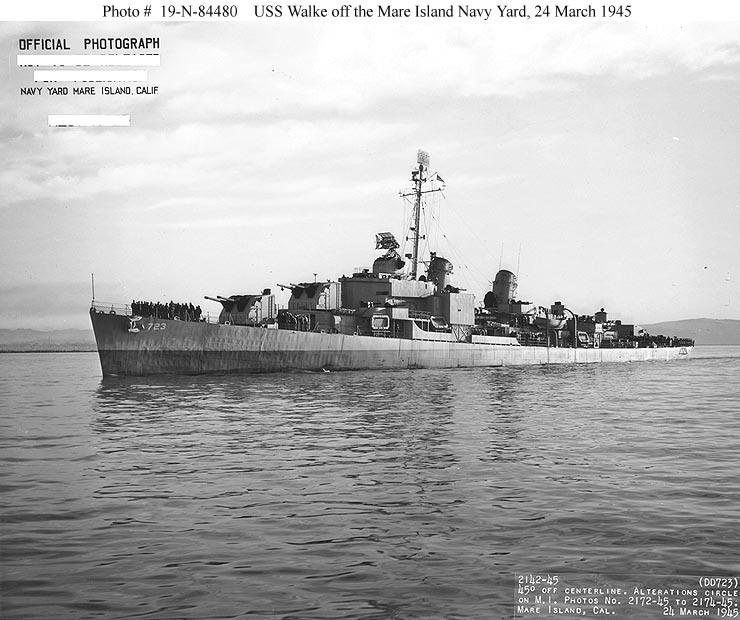 USS Walke (DD-723) underway, circa the late 1940s or very early 1950s. Photo was received by the Naval Photographic Center in December 1959, but was taken several years earlier. Port quarter aerial view. The ship still has her World War II era radar antennas. 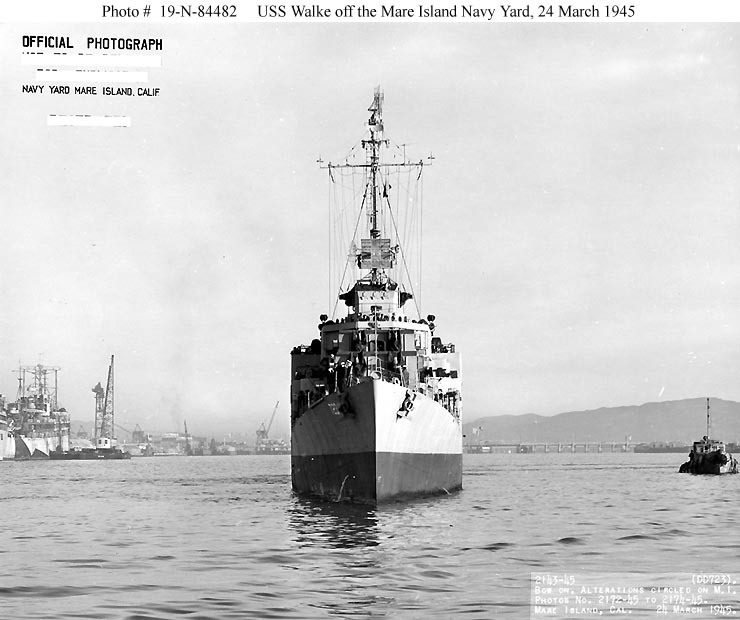 USS Walke (DD-723) in harbor, circa the late 1940s or very early 1950s. Photo was received by the Naval Photographic Center in December 1959, but was taken several years earlier. Port bow surface view. The ship still has her World War II era radar antennas. USS Walke (DD-723) in harbor, August 1954. Starboard broadside (somewhat toward the bow) surface view. The ship has a tripod foremast, 3"/50 secondary battery, and 1950s era radar antennas. 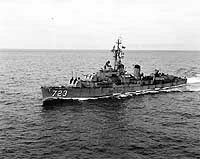 USS Walke (DD-723) underway while operating with the Seventh Fleet in the Far East, 9 March 1958. Starboard broadside (somewhat toward the bow) aerial view.